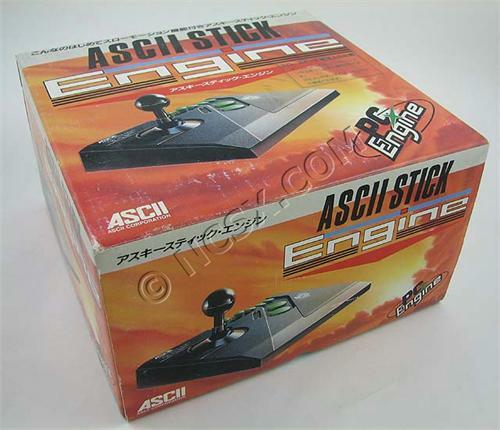 «©NCS» Before Hori took over de-facto production of third party controllers, memory cards, and accessories in Japan, ASCII was the king of the realm. In the 80s and 90s, the company commanded a healthy market share for Famicom, PC-Engine, and Super Famicom accessories. Today, we offer PC-Engine joysticks that were originally released by ASCII in November 24, 1990. The base of the controller measures 7 3/4 x 6 5/8" and the lollipop-style joystick rises up about 2" from its foundation. Similar to a standard PC-Engine control pad, the ASCII Stick Engine features a turbo-fire function for the buttons but the level of turbo may be adjusted with by twisting two dials for button 1 and 2. To the immediate right of the turbo dials are Slow, Select, and Run buttons. The joystick is non-clicky and moves around with nary a sound. The buttons are springy and offer a tactile response to your pressing and occasional mashing. The cord measures approximately 5" and is approximately an extra foot longer than the cord on a standard PC-Engine joypad. Please note this controller is only for use with a Japanese PC-Engine Core Grafx, PC-Engine Duo, and USA Turbo Duo consoles. The controller is not compatible with the USA Turbo Grafx 16 due to the different controller port used on the console. All stock is new from NCS inventory but please be advised that there is slight to severe weathering of the outer cartons from nearly 20 years in warehousing. Some of the wear on the boxes look positively wretched but nonetheless, they contain a spanking new, never manhandled joysticks inside. Opening up the cardboard carton will also release the fresh scent of plastic and styrofoam. Funny how petroleum based packaging material tends to stay fresh forever. Each joystick is priced at US$65 + shipping. NCS recommends UPS Ground for our USA based customers and US Airmail International for our international players. This document and photos are ©NCSX 2007, 2009. All rights reserved. No reproduction in whole or in part of this document may be made without express written consent of National Console Support, Inc.